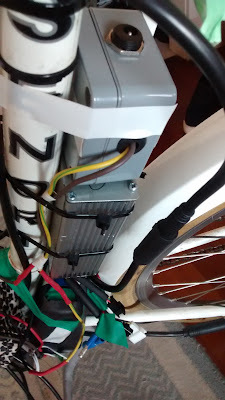 The latest task on the e-bike was moving the battery pack from its temporary home on the back carrier, in a dodgy shoe box, to being properly mounted in the frame. 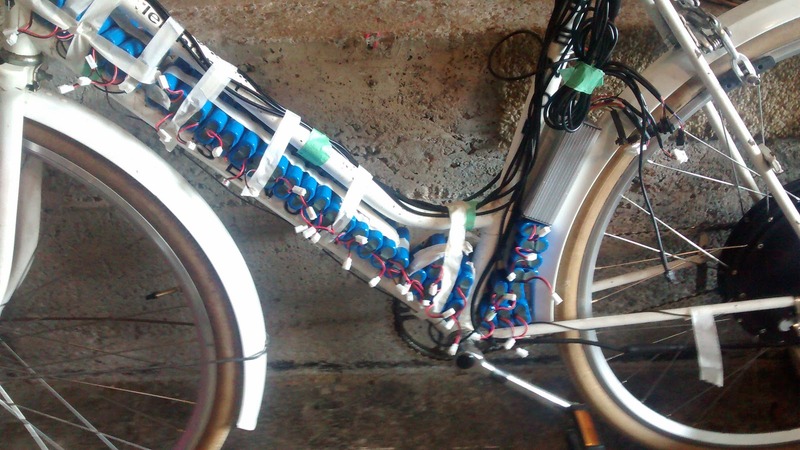 Having the batteries on the back carrier is problematic because it shifts the centre of gravity on the bike from the centre, to the rear wheel. This in turn makes the bike not handle as nicely. 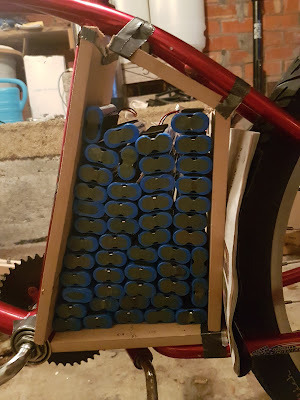 I wanted the batteries to the be incorporated into the bike frame, balancing the bike weight, and making it look cooler than a normal e-bike. I'm personally not much of a measurer, nor am I very good at picturing physical objects in my mind. Instead I like prototyping first, and adjusting later. For the battery pack, I got some extra batteries I had lying around, and mucked around with taping them to the frame, to see what fit. After I managed to get all the prototype batteries in the frame in a way I was happy with, I disassembled the actual battery pack, and reassembled it in the new geometry. I actually split the pack in two, with the majority of the batteries sitting underneath the main crossbar, and the extras under the seat post. 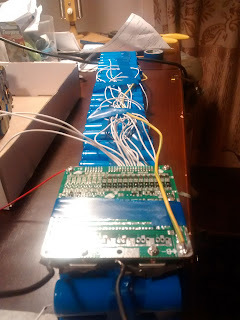 Once this was done, I covered the whole pack in large heat shrink. 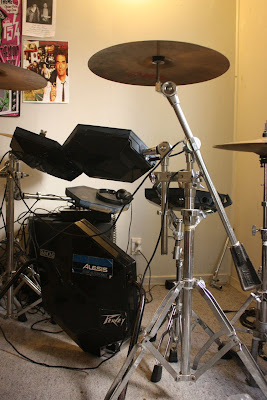 This gives the pack a bit of weather/impact protection, and hold the whole thing together. 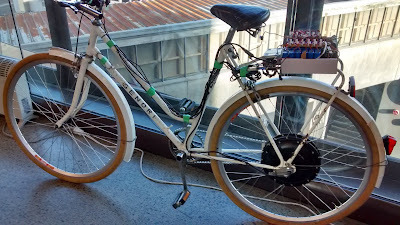 I fixed the battery pack to the frame with cable ties. Warming up the heat-shrink with a rework gun. Jenna started riding the bike around this time, and after a short while managed to get the charging socket caught on her dress, consequently disconnecting the main power rail. This prompted me to fit the socket into a small plastic box. This now sits on top of the controller, allowing easy (and protected) access to the charging socket. Jenna then went about and patterned up some weatherproof bags out of some very chic cheetah print cloth. There's probably a whole blog in how she went and did this, alas I just left her to it, and only saw the end result. 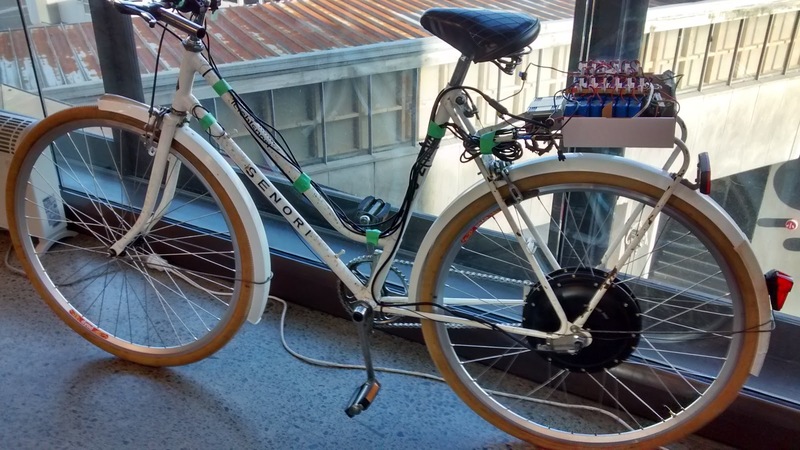 At this point the bike is starting to be usable (finally). Things to be done in the immediate future are making up some custom e-brake levers, getting the chain guard to fit, maybe fitting a dress-guard, and perhaps direct wiring up some lights to the main battery pack. Phew! Such great work you're both putting into this! Loving seeing the progress made. Will have to get a ride next time I'm up (since I somehow managed to forget last time). Cheers dude! Yep let's definitely have a hoon together next time!! Your post is very nice and informative. Specially your title Borderline Music Shenanigans goes very well with the post. I read and enjoyed a much. Thanks a lot and I will wait for your next post.